Mutations occur through various mechanisms that can impact genes, chromosomes, and outcomes differently. Mutations can occur on a single nucleotide scale (at the level of point mutations), or on a much larger scale (where segments of whole chromosomes are affected. Substitution of nucleotides can be synonymous (silent) or non-synonymous (change amino acid). The resulting mutations can be missense (amino acid change in sequence) or nonsense (premature stop codon is encoded. Insertions and deletion of single nucleotides can cause frameshift mutations, changing the sequence of the entire protein. Chromosomal mutations include large-scale deletions, inversions, duplications and translocations. DNA sequences are transcribed into an mRNA sequence, which is then translated into a protein. This translation relies on the triplet code, whereby a sequence of three nucleotides codes for a particular amino acid. Several different codons can code for the same amino acid. This is important for the consequences of mutations. Point mutations refer to changes to a single nucleotide. These usually take place during DNA replication, and their consequences can be benign, or can be devastating. This depends on the location of the mutation. Point mutations occur through insertion, substitution or deletion. 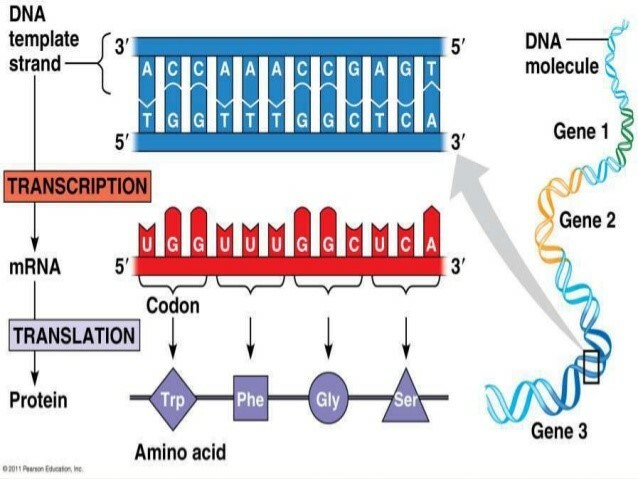 Substitution refers to the case in which one nucleotide is incorrectly swapped during DNA replication for another nucleotide, meaning the correct nucleotide is replaced with an alternative nucleotide. This type of mutation only affects one codon. However, this does not mean the resulting effects will be small. The substitution could change the amino acid that the DNA encodes, changing the protein sequence. This is called a non-synonymous mutation. Alternatively, the nucleotide substitution could not affect the encoded amino acid (since multiple codons can occur for the same amino acid). This is called a synonymous mutation. An easy way to remember this is ‘S’ for ‘synonymous’ and ‘silent’, the mutation is unlikely to have an effect, and therefore is silent. If the affected amino acid is at a critical residue such as in an enzyme’s active site, or at an important binding site, the function of the entire protein could be abolished. Insertions and deletions are two other types of point mutations. An insertion occurs when an extra nucleotide is incorporated into the DNA sequence during replication. A deletion mutation occurs when a nucleotide is skipped or absent from the replicated strand. These mutations are often considered more harmful than substitutions, because they impact upon the way the rest of the sequence is read by the cell. Missense mutations refer to the point mutations that cause a change to a single amino acid. Missense mutations are usually caused by substitutions. Even though only one amino acid is affected, the consequences can be deleterious. An example of a disease caused by a missense mutation is Sickle-cell anaemia. Sickle-cell anaemia is caused by a point mutation in the protein haemoglobin. The amino acid glutamic acid is replaced with valine. The properties of these amino acids are sufficiently different, causing changes in the structure of the protein. This causes red blood cells to become distorted, and they can no longer efficiently carry oxygen. Nonsense mutations are a special kind of missense mutation where the amino acid change results in the production of a stop codon (TAG, TAA or TGA). 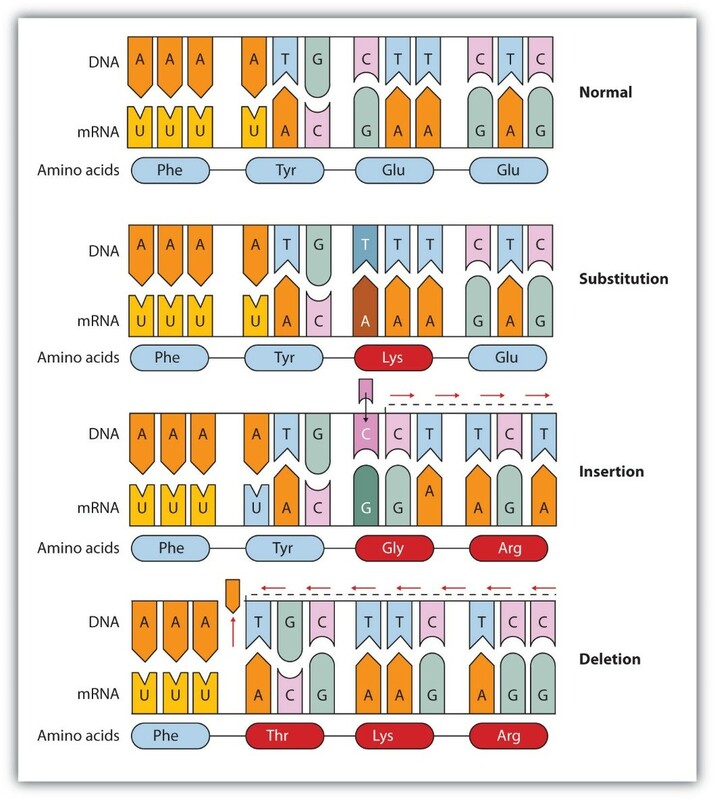 These codons do not encode for amino acids, and instead encode a signal to the translation machinery that they should terminate the process of translation. This premature stop codon results in the production of a truncated protein, which is usually non-functional. An example of a disease caused by a nonsense mutation is Duchenne muscular dystrophy. Duchenne muscular dystrophy is a degenerative disease associated with progressive muscle weakness. The disease is caused by mutations in the dystrophin gene, which is important in skeletal muscle cell structure and function. Nonsense mutations in the dystrophin gene result in a non-functional protein, causing the disease. Insertions and deletions of nucleotides can also have the consequence of a frameshift mutation. This causes a complete change to the entire amino acid sequence of a protein after the mutation site. This is because of the way the translated mRNA is read by the ribosomes. The mRNA is read in codons, groups of 3 nucleotides. If an additional 1 or 2 nucleotides are added or removed, the sequence is ‘shifted’. The translation machinery cannot know that there has been an error, and still reads the sequence in triplet codons. This means the entire mRNA and resulting protein are completely different. For example, look at the sequence below. Imagine you are the mRNA machinery and can only read 3 letter words from left to right. An example of a disease that can be caused by a frameshift mutation is Tay-Sach’s disease. Tay-Sach’s disease is often caused by a frameshift mutation in the gene Hex-A. Without Hex-A, lipids accumulate abnormally in the brain, causing progressive damage to the cells of the nervous system. This usually results in infant fatality at around 5 years old. Chromosomal mutations are larger scale mutations than point mutations, typically involving segments of entire chromosomes. Chromosomal deletions involve the loss of an entire region of a chromosome and all the genes contained within it. An example of a disease caused by such a mutation is Cri du Chat Syndrome. Cri du Chat is caused by a deletion in chromosome 5. It is a rare genetic disorder, and the name comes from the French for “cat-like cry”, which refers to the unusual kitten-like cries of affected children. The disease causes developmental delay, problems with the nervous system and behavioural issues. Chromosomal inversions occur when a particular sequence is flipped and reinserted, meaning the sequence is in the opposite orientation. This does not typically cause disease, but there are some rare examples. Chromosomal duplications involve the repetition of a region of the chromosome, resulting in double the number of genes (and gene products) which are contained within it. This occurs in some rare genetic disorders and is associated with some cancers. Chromosomal translocations occur when a part of one chromosome is incorrectly fused to a segment of another chromosome. The danger of these types of mutations is the possibility for gene fusions. The most common example of this is the Philadelphia chromosome which occurs in some types of leukaemia. The Philadelphia chromosome is an example of a translocation, where two segments of chromosome 9 and chromosome 22 swap places. This results in a gene fusion that encodes a hybrid protein that is always ‘on’, meaning it is overactive. This contributes to cancer by allowing the cell to divide uncontrollably.